Here we are again - another month of AMAZING bloggers getting together to share some Bright Ideas. 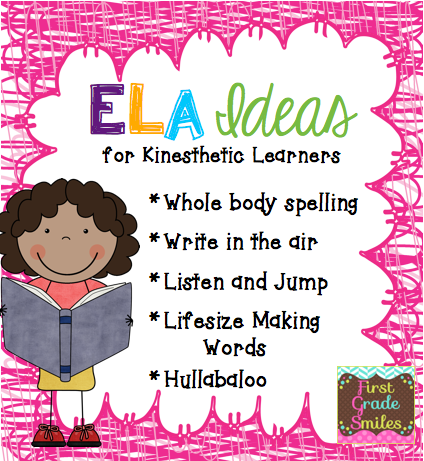 This time I'd like to share some ideas for those wiggly, bouncy, chatty, energetic, wonderful, kinesthetic learners. We all know 'em. We all have 'em. 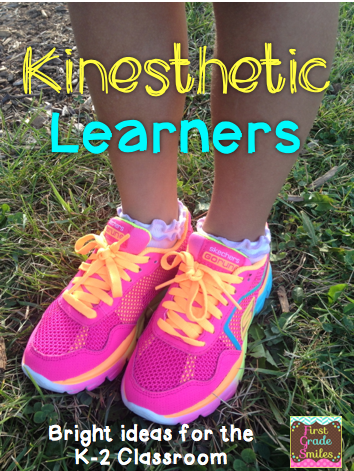 I think kinesthetic learners would pretty much describe almost every child in my class in 1st grade. Maybe it's the age, or maybe it's just my group of lovelies this year - but either way, I think all primary teachers can agree that it pays to have some strategies in your back pocket to break out when you see the wiggles start kicking in. Not to mention that most children learn best by doing. All of the ideas I'm going to share are ones I use in my classroom. I'm not claiming to have created these ideas, and I'm sure many teachers use the same ones, but I just wanted to share what I do. I hope you will see something that inspires you and you can try out in your own classroom. I named these ideas just to help explain, but if there is another name for them that maybe I don't know about or if there is an original creator, please feel free to let me know. I will always give credit where credit is due. 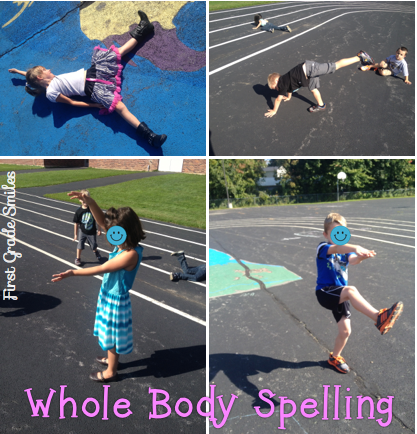 Whole Body Spelling is using your whole body to form letters to spell a word. You could do this with sight words or other spelling words. You can do it in the classroom, but my students love going outside to do this. We even go out in the winter and do this in the snow. 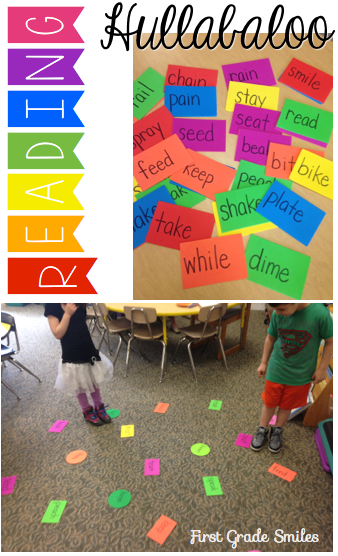 Listen and Jump is something we do when reviewing sight words, rhyming words, or vocabulary words. 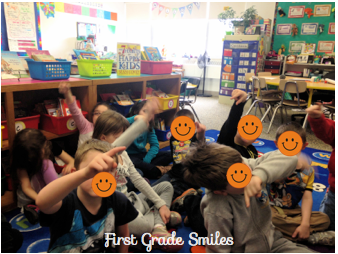 In this picture all the kids have sight words and when I say a word that they have, they jump up in the air. They LOVE this one! Sometimes I will give them other words and say if your word rhymes with "cat" then jump up or if your word starts with a "b" sound jump up. This is also fun because a couple kids might jump up at the same time. Again - simple, but gets 'em moving. Lifesize Making Words - We use letter cards to spell words. As we stretch out the sounds the kids will either stand up or hold up their letter. Sometimes we have vowel teams and those kids link up their arms and say their sound together or we put a Super E at the end of the word and have him/her flip the vowel sound. The person holding the vowel turns around in a circle and says the long vowel sound instead. 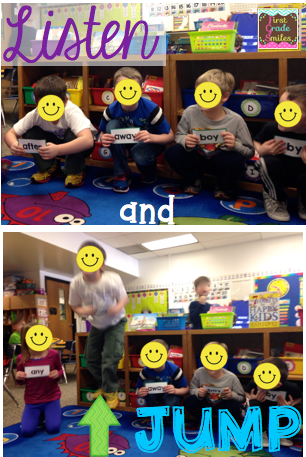 Acting out phonics is something that really helps my lower readers. They seem to remember things like flipping the vowel and linking arms and so on. Great visual for the whole class. Finally, and probably our MOST favorite, is a variation of the game Hullabaloo. This is such a cute game and my 3 and 5 year old girls really love playing this at home. In the actual game there are rubber mats that have pictures and words with things like animals, food, instruments, etc. You spread these out on the floor randomly. Then you turn on the "announcer". The announcer says things like "Slither over to a yellow mat" or "Hop over to a food". The kids move around and find the mats he's talking about. Then he will say something like, "If you are standing on the elephant you win - take a bow." It's super cute! 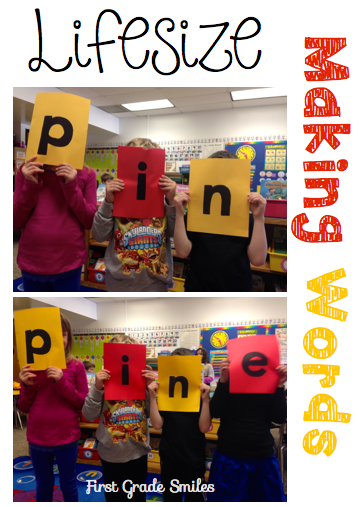 So I decided to make this into a classroom game to practice word families and as we learn new spelling patterns. 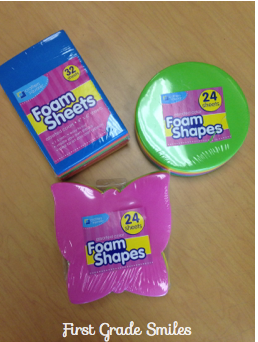 I use these pack of foam shapes that I got from the Dollar Tree. Then I write words on them using a sharpie. Right now we are working on long vowels so the pack of words I'm using has CVCe words, vowel teams, and also includes blends and digraphs. But in the beginning of the year I just use CVC words and slowly add in blends. We spread out the words on the floor and I will give directions like, "Tiptoe over to a word that rhymes with feet" or "Crawl over to a word that has a long e sound." We just stand next to the word instead of on them and then I have them read the words they chose. I play this with small groups of children so it is more manageable and because I don't have a ton of room, but it could be played as a class too. In the actual game kids can share mats, so sometimes we do that too. 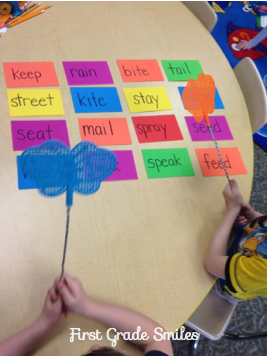 I also use these same cards at our reading table with fun fly swatter to swat the words if we don't have time to spread them all out on the floor. This is also a class favorite and super quick to set up when I don't have the time for the full thing. 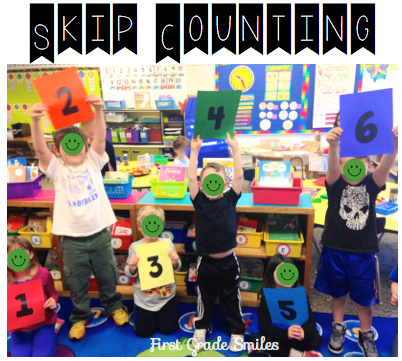 First up is skip counting. We use numeral cards that I quickly printed on the computer and laminated and each child has a number. We sit in a line or a circle. If we are counting by 2s for example, we will count around the circle and whisper the odd numbers and then shout (not too loud) the even numbers while those children stand up. Then we switch it up and count by other numbers. If we're counting by 3s, we would whisper 1,2 and shout 3, whisper 4,5, and shout 6, and so on. 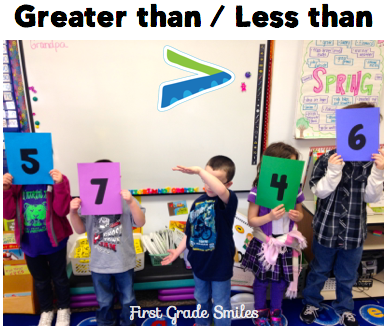 For Greater than/Less than we use the same numeral cards. We make numbers between 0 and 120 (first grade common core standards). Then I have a student stand in the middle and hold their arms like the sign. We practice reading it together. For example: 57 is greater than 46. We will also make numbers and put them in order from least to greatest or vice versa. Sometimes we turn the numeral cards into necklaces using sheet protectors and string and they don't have to hold up the numbers. This next one is something I am planning on getting when I have the money, but wanted to share it with you. In my classroom I have made a Lifesize Tens Frame out of a dollar store plastic tablecloth and washi tape for the lines (sorry no picture). We have kids stand in the tens frame to practice counting, adding, and subtracting using our bodies. 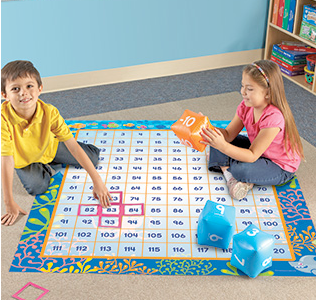 But I also just found online this giant 120 chart and blow up dice that I think I will HAVE to get. I also saw another one that was even bigger where the kids move around on it. How fun! Finally is my version of Math Hullabaloo. This is the same idea as the reading version, only using numbers. Again, I write a bunch of numbers between 0 and 120 on the foam shapes using sharpie. Then we spread them all out. I give clues such as, "Dance over to a number with 6 tens" or "Slide over to a number greater than 30." Super fun! 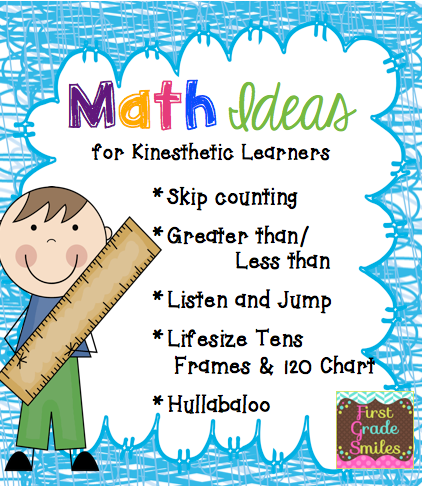 Thanks so much for stopping by and checking out my Bright Ideas for Kinesthetic Learners. If you enjoyed these ideas, please consider following my blog on Bloglovin' over on the side or following me on Facebook or Instagram. Melissa, being blind, kinesthetic learning is my absolute favorite! My kindergarten kids this year are also EXTREMELY wiggly. I've never heard of Hullabaloo before, so I'm very appreciative that you wrote this post. Thank you so much! Thank you for sharing your great ideas! 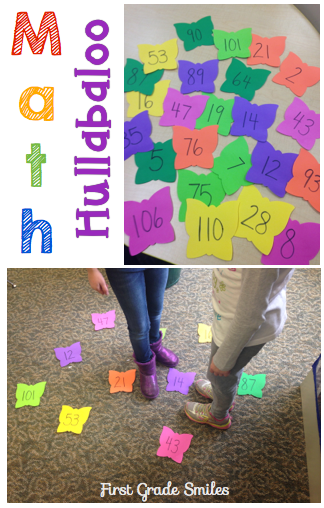 We love Hullabaloo at home, I bet my firsties would live this version! These are great ideas! I love to see a teacher so open to accommodating various learning styles. My daughter is an active learner so I'm definitely filing some of these away! Why is it snowing outside in APRIL? ?